Search Results for: "Peter Lyon"
TheOneRing.net with Galatia Films offer this exclusive interview with the always phenomenal Richard Taylor, Daniel Falconer and Peter Lyon of Weta Workshop. If you watch the video you will learn about Weta’s first meeting with Peter Lyon and how “The Lord or the Rings,” behind-the-scenes videos were created, developed and even changed people’s lives. The original interview was done for Galatia’s Live Reclaiming the Blade Day. Check out its Kickstarter page for more details and the full interview. Tomorrow we will release another interview from the live broadcast, this with one of the stars from “The Lord of the Rings” film. Tune in tomorrow to find out which one! You can also support the Kickstarter campaign for a new film that will feature “The Hobbit” swords and Narnia actors Ben Barnes (Prince Caspian) and William Moseley (Chronicles of Narnia). In this neat little video, Channel 7 Australia’s James Tobin chats with master swordsmith Peter Lyon about the weapons he made for The Hobbit. Some really interesting info about Orcrist, Thorin’s /other/ sword and Bolg’s massive be-spiked war-mace. 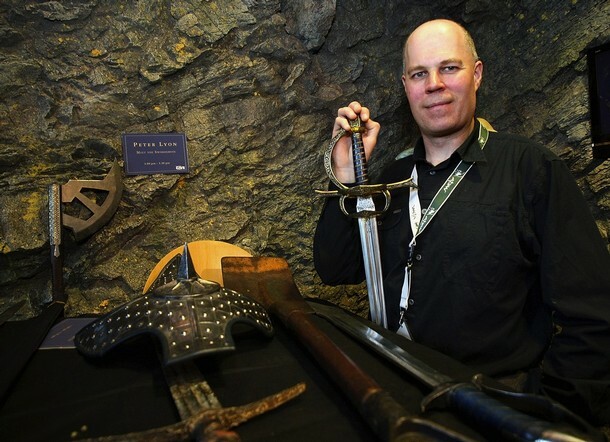 WETA master swordsmith Peter Lyon answers some commonly — and uncommonly — asked questions in this insightful Q&A session over on the WETA NZ website. Go check it out. 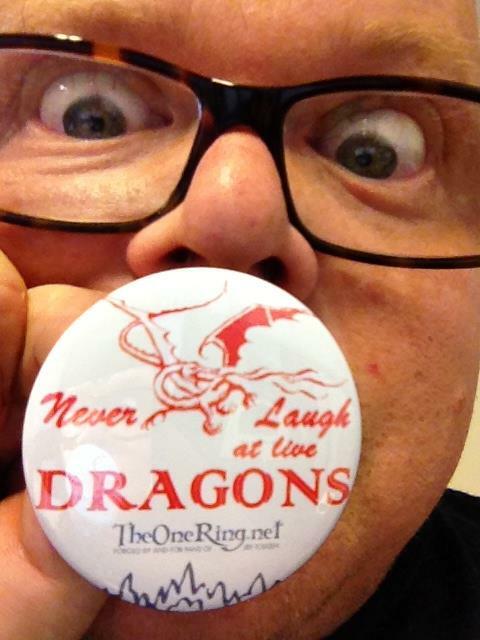 Peter Lyon Confirmed Work on The Hobbit! Nickey writes in: Dear TORn Friends, My friend and extraordinary artist, Peter Lyon, will be making his way to the Royal Armouries Museum in Leeds as of a flight this evening. He is very excited about the trip. If you are in Leeds, please stop by and see the exhibit while he is there. Cheers! A reminder: the “Arms and Armour from the Movies: The Wonderful World of Weta” exhibit runs until November 16 at the Royal Armouries Museum in Leeds. Read more in our previous article about the exhibition, or at the Exhibition Site. 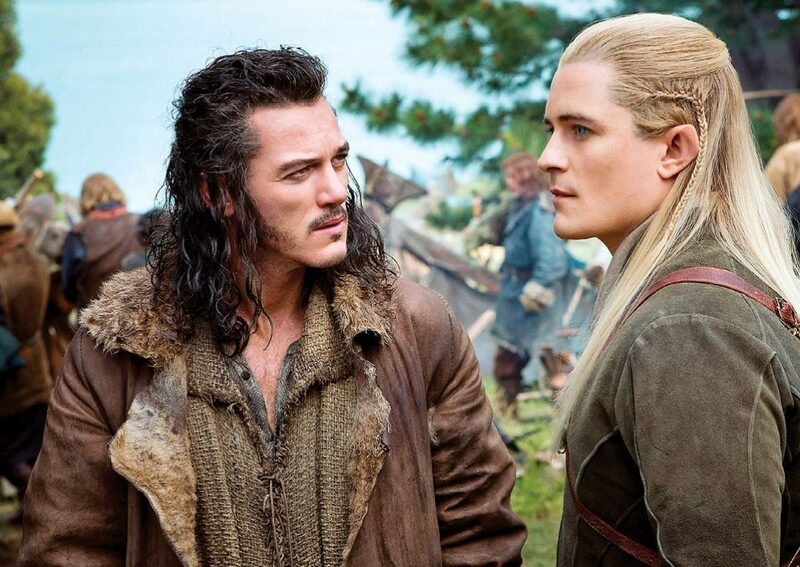 Peter Lyon to return as Hobbit swordsmith? Peter Lyon, the man responsible for translating John Howe’s visions into LOTR’s workable weapons props, says he is looking forward to working on the Hobbit.The comment came in a reply to a recent fan mail, where he said that, all going well, he was looking forward to “completing the circle” to that part of his life. Lyon did not say whether his involvement was confirmed, but his words do sound hopeful! Peter Lyon And Kirin Shah Chat With TORn! 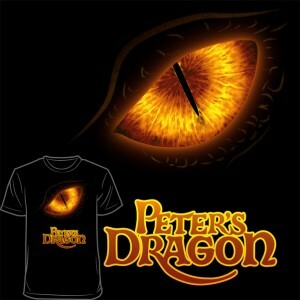 Pre-Order the new ‘Peter’s Dragon’ T-Shirt! 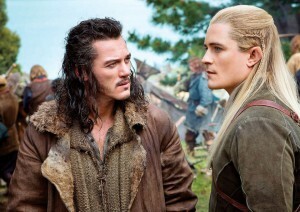 So, what do we actually know about The Hobbit: The Battle of the Five Armies? This constantly expanding list is TORn’s — with the help of our eagle-eyed readers — attempt to document all our knowledge of film three (at least until we get inundated by post-trailer and SDCC marketing). Welcome to the latest “Getting to know” – questions that need answering. It’s based on the old Getting to know you threads that I occasionally post on the message boards here on TORn, so those familiar with them will know that the questions can be a little crazy and the answers even crazier. This month we’re asking questions of self-described Online guy at Weta Workshop and all round top bloke, Magnus Hjert. 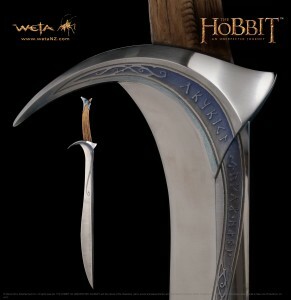 Tonight a new item from Weta Workshop has been made available for order: Orcrist, Master Swordsmith’s Edition. If you’re a fan of what you’ve seen on-screen, and want to own an item that is truly as close to what was used in the film as possible, then this item is for you. Peter Lyon, Master Swordsmith, who helped create the amazing weapons you saw used in The Lord of the Rings Trilogy and The Hobbit: An Unexpected Journey, has created another amazing replica in Orcrist. 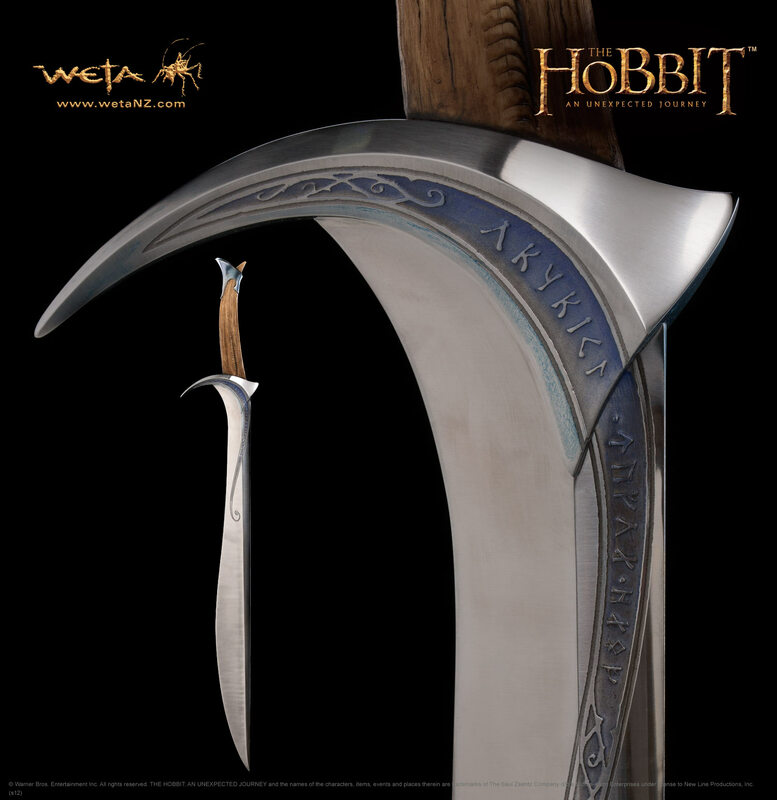 Orcrist is the fifth sword Peter created for Weta giving fans a chance to bring piece of Middle-earth home to their collections. 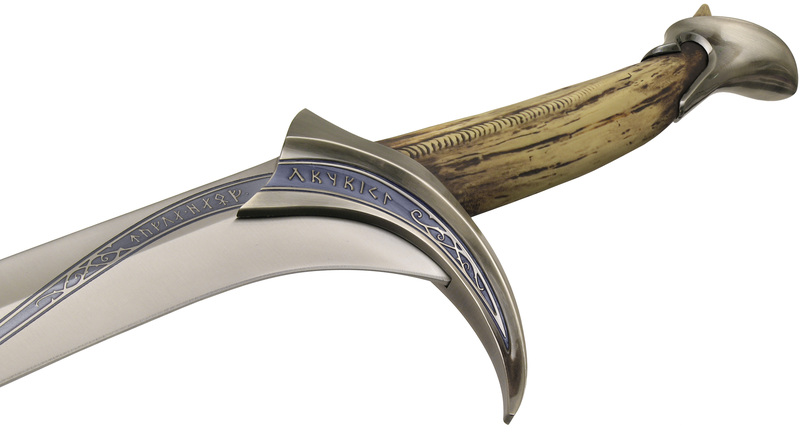 This replica is an outstanding blend of steel with a dragon’s tooth resin handle molded to look like wood. 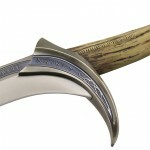 Orcrist costs $9,900 and when you place your order you can also get the amazing scabbard that Thorin wore in the movie. Forged long ago in the lost Elf kingdom of Gondolin, Orcrist, the ‘goblin cleaver’, was a legendary blade, well known to the wise of Middle-earth and infamous among their enemies. Having disappeared for centuries, the sword would reappear in, of all places, a Troll hoard, where, among the detritus and ruin, it catches the eye of Thorin Oakenshield. To the Dwarf, well versed in the crafting of fine weapons, it is a sword of peerless craft, but it is Elrond, lord and lore-master of Rivendell, who is able to name the blade and tell Thorin of its prestigious lineage. No finer sword could a king of any race wish for. Orcrist was designed by Weta senior concept designer Paul Tobin and made at Weta Workshop in New Zealand for The Hobbit: An Unexpected Journey by Master Swordsmith Peter Lyon. The fifth sword in Weta’s Master Swordsmith’s Collection, Orcrist takes swordmaking even further than previous swords in the series. The first single edged blade in The Master Swordsmith’s Collection, it encompasses a multitude of sword making, metal crafting and wood working techniques. It joins the previous swords in the series: Andúril, Strider’s Sword, Glamdring and the most recently launched sword, Sting – still available to order! Orcrist is made with the same attention to detail that the swordsmiths of the lost realm of Gondolin would have required. Peter Lyon took Paul Tobin’s design and created a piece of art and a usable weapon wrapped in one. The blade is made from tempered spring steel and the dragon’s tooth grip is cast from CC60 urethane, painted and sealed under resin. On the cross is the name “Orcrist” etched in runes and the gently curvaceous blade, ground from spring steel, features etched elven runes stating “The Serpent’s Tooth”. On the pommel are four cubic zirconia gemstones inlaid. The scabbard is made from a combination of white oak and steel and connects to the leather belt with leather straps and buckles. The inscription translates as “Born from the Maws of Dragons I am Always Hungry and Thirsty”. The belt is made from embossed leather with steel buckle, loop and tip. It features straps for attaching the scabbard. Thorin wears his sword on his back and this belt is designed to be worn over the shoulder. This sword and its accessories are the absolute epitome of craftsmanship.